When will YM's, and wanted to Login to Yahoo Messenger on Blackberry, you suddenly can not log in, and only appears Error Invalid ID or Password Yahoo Messenger , but you have to enter ID and Password YM correctly, the evidence Log in Laptop now, going well and able to login. To solve a problem like this, you can try some of these solutions. 1. Standard first aid on the Blackberry, do hard reset (when the blackberry is still on, pull the battery for 30 seconds or so after that plug it again), do not forget to re-ignite after the Blackberry do HRT or Host Routing Table after it tried to login again. 3. Login by using the YM ID to another can or not? Or it could also try changing your IM passwords used in laptop (and make sure the password number and letters only do not use symbols); after the password is changed then try to log in YM. 4. YM Delete Applications on the Blackberry. Go to the BB App World, and My World and Delete Yahoo Messenger, after the delete YM do Restart Blackberry. The next go to Service book, locate the entry named [BBIM] and make sure you find BBIM Yahoo (because this BBIM assortment, one for ICQ, AIM, etc.). Once you find BBIM Yahoo, and then delete entry. After Yahoo BBIM on delete Service Book of the Blackberry, then do the Install Yahoo Messenger through Blackberry App World. 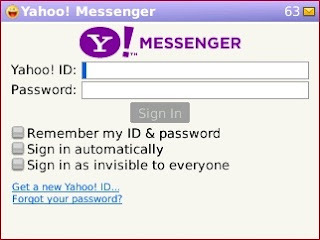 When the Yahoo Messenger is complete is installed, try to login. On the list there, you can Remove all existing connections, or you simply remove or delete that relate to Yahoo Messenger Authentication. Do not worry; the list will be automatically created here again, when you login from the mobile phone or Blackberry. When you have removed the Y! Messenger Authentication or all entries in the Manage Apps and Web Connection, then you can try to login to YM on the Blackberry. 6. Enter Blackberry browser you, then do a Clear Cache, Cookies and History in the Blackberry Browser.